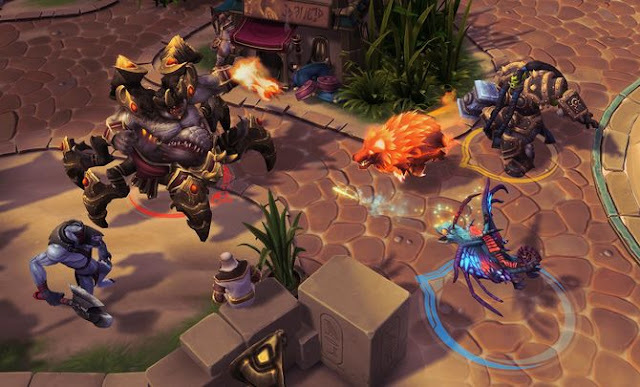 Heroes of the Storm is produced by Blizzard MOBA - game. This means that there is no real story in the game. Rather, it is a PvP-based game. In a MOBA it is mostly about: there are 2 bases, the opponent and their own. The goal now is through tactical approach the base of the enemy to destroy. However, off the enemy base stand on the often protective towers, which inflict a lot of damage if you get too close to them. In Heroes of the Storm but there are some interesting game mechanics. As you can already see, you can invite his friends in his group immediately after start of the game. This is the groups looking much quicker. In addition, you can register as a "Group Seeking" at the right edge of the screen. Time a very different MOBA! Heroes of the Storm is very different from other MOBA's why ? In Heroes of the Storm to play more as a team: In Heroes of the Storm the whole team gets experience points for kills. That is every hero of the team to level up at the same time, no matter who killed as many mobs / opponents. No gold? No Problem! Because in Heroes of the Storm one buys any objects, your skilling always a certain level the talents that seem a most useful. Here you decide the best after what could possibly use your team well. Each hero can have different skilling talents. Furthermore, in Heroes of the Storm many familiar characters from Blizzard games are used which often possess skills that they have in their actual game too! Otherwise, it's like any other MOBA, just try not to die. Because if you die that's a big disadvantage for your team because you're not then some time on the pitch. Initially, this is not quite so tragic, but the higher the level your hero, the higher the latency after death. So be careful! However, if you don’t have time to wait for a good group, you can also start a quick game and hope that the group members are not all too bad. You can reach this screen, if you at the previous screen click on top of his name or his hero, or click Play at the bottom left of the screen. Now you can also switch the hero, you just look for a hero out of you liked, you really cann’t go wrong and you change your mind at any time after a game, if you don’t like the hero. You can select a hero, look at his skills and to read, that you may reasonably know what the hero can do anything. If you have much time left you can with the heroes in the Shop area of the game once practice. This is done against a computer-controlled opponent who attacks you only occasionally. As you can see already, you can in this game skins and mounts unlock / ransom. The mounts are only used to get faster on the map. You have a certain cast time and dissolve in the fight automatically on. With the option "play mode" you can select different game modes. There are 6 different to choose from. Practice Mode: In this game mode you can by yourself or with computer-controlled allies compete against computer-controlled opponents, which are very weak. This mode is, however, no empirical points. Co-op: In co-op you play together with other players against computer-controlled opponents. This mode is good to learn the basics of the game to train a bit. In this mode as well as in the next mode you gain Experience Points for your hero and yourselves. Quick Search: The Quick Find playing together with other players in turn other players, but here are all in the same Lvl range, so it does not become unfair. Now we come to gameplay. When you start a game you find yourself still in his own base. From here you can now run on the various lanes (bottom right of the picture you can see the mini map and thus also the different lanes). In my example, I play on the Map "ghost mines" There are a total of 6 Maps. Each map looks naturally different, most of them have 3 lanes. It is so very clever, his team distributed among the respective lanes. However, if it is tough times to one lane, the team members can of course always come to the rescue. On this map, it is now necessary to go into the mine once it is opened, there to kill the mobs. When the time has expired then, each team will receive a golem, the more mobs killed each team the stronger the respective Golem. Each map has a different mechanism. Are useful mainly to make each game more interactive, so not everyone the whole game is at its Lane around long. Especially go each game over also faster because the Bonus obtained can be very devastating for the team. In bottom of the screen we find the charm of our character. Each character has a Q, W, E, R (from a certain hero-Lvl) and a passive skill. With the Y button, we can climb to our mount on / and off. With the B button you use your hearthstone, which brings you to your base back. Bottom left we now see our hero. The green bar reflects the health again, while the blue bars indicate the Mana. The skulls are among the killings that have achieved her during your last death. From the players level 6 you'll get daily new quests which offer you different tasks. Whether you like it or not graduating, is up to you. You gain this only a little gold in order to buy you a couple of new heroes. The first Quest for example, is that their 3 games long as a supporter Plays. There are also quests where their characters from a particular game must play. For example, from Warcraft. You have to fulfill the quest, don’t win 3 games, but just to finish games. The quest progress you can see, when you're not in a game, at the bottom right of the screen there is a "!" Character. If you there you see your entire active quests.